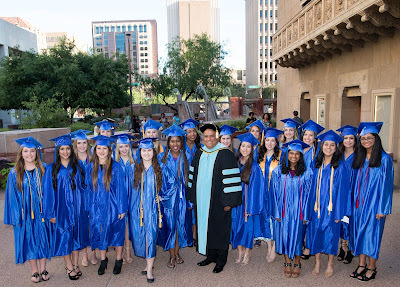 Rio Salado College | RioNews: Xavier College Prep Grads Lead Dual Pack! Xavier College Prep Grads Lead Dual Pack! Earn college degree before graduating from high school -- check. 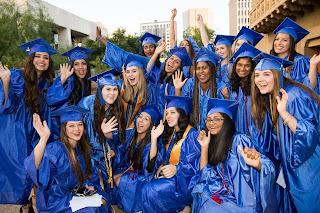 Astonish friends and family with academic achievements – check. Be two steps ahead on life’s path to success – check. The students of Xavier College Preparatory in Phoenix are leading the pack when it comes to dual enrollment. 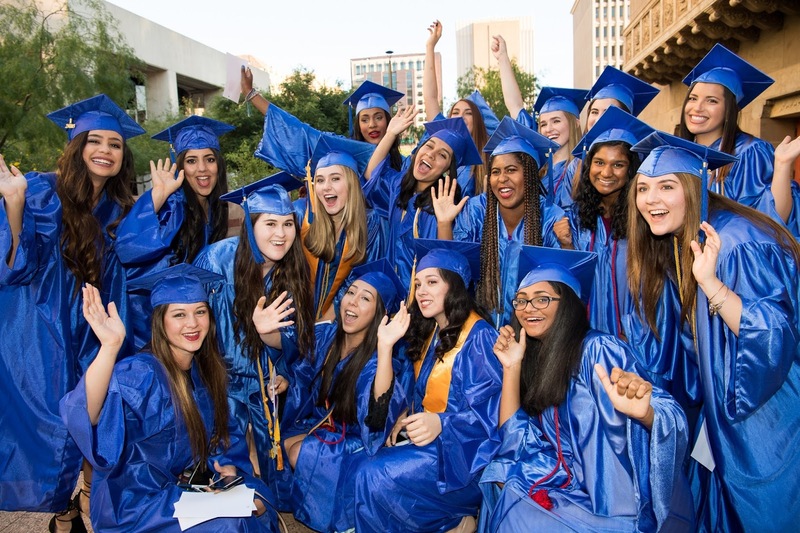 Of the record 64 Valley high school students earning associate degrees from Rio Salado College this spring, 33 are from the all-female Xavier College Prep. Thanks to dual enrollment, Xavier students Andrea Gray, Miranda Albo and Ashlynn Holloway all have big plans for the future. Gray’s future plans include pursuing an engineering career after being exposed to a STEM (science, technology, engineering, and math) program through Girl Scouts in fourth grade. “I knew then I wanted to be an engineer and stumbled across aeronautical engineering,” Gray said. 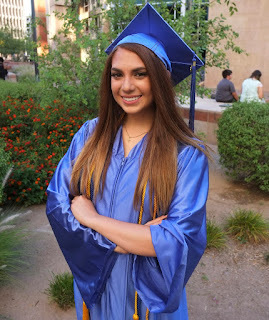 She is graduating from Xavier Prep with a 3.8 GPA, and earning an Associate in Arts at Rio Salado. Gray plans to attend Embry-Riddle Aeronautical University in Prescott, majoring in aerospace engineering with a concentration in astronautics and a minor in global security. Eventually, she plans to earn a master’s degree and hopes to work for NASA or SpaceX, the independent American aerospace company run by Elon Musk. Albo, who is also earning an Associate in Arts, will be attending the University of Arizona this fall. She is interested in studying a STEM subject, but also finds joy in art classes like sculpture and ceramics. “I love the idea of working with my hands and creating an object that has meaning to it,” Albo said. She credits dual enrollment for its convenience and affordability. For Holloway, dual enrollment offered a chance to get a head start on college. “With my basic courses taken care of, I now have the advantage of taking college classes that are major-specific, which will allow me to learn more as I continue my education,” Holloway said. Holloway is graduating with an Associate in Arts from Rio Salado and has a 3.8 GPA at Xavier College Prep. She plans to pursue a double-major with the courses that have been freed up through the dual enrollment program. Holloway said the success coaches in the dual enrollment program at Rio Salado also helped her find alternative ways to complete the requirements for an associate degree with her busy schedule, setting up options like online classes. Sister Joanie Nuckols, Vice Principal for Academics and campus minister at Xavier College Prep, said the high school has a tightknit community based on common goals of educational excellence. “The most rewarding aspect of teaching is watching students learn to think critically, grow in wisdom and be able to explain their own point of view,” Nuckols said. Whatever paths they each may choose, the students at Xavier College Prep are fit to conquer anything that comes their way. 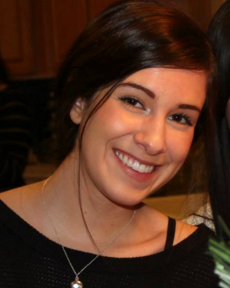 Contributing writer Alyssa DeMember has served Rio Salado's Academic Advisement team since 2014. 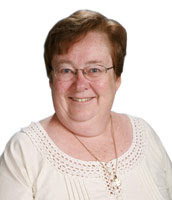 She is one of several academic advisors available to help you along your educational journey. Labels: AdvisementNews, CPDNews, Excellence in Education, LifeAtRio, LiveAtRio, Online Student, RioCommunity, RioEmployee, RioGrad, RioLearn, RioLocal, RioLounge, RioNews, RioStudents, RioStudents.